Olympic athletes should have tailored heart screening to check for life-threatening conditions before they can compete, a leading Italian doctor says. After running extensive tests on 2,354 elite athletes, he discovered six had potentially fatal disorders that disqualified them from taking part. His early findings were presented at a European Society of Cardiology meeting. But the British Heart Foundation (BHF) says screening is not yet precise enough to be offered routinely. Heart screening is designed to pick up abnormalities that could leave people at risk of sudden death. This is rare but according to the BHF it is more common in athletes than the general population. Figures suggest one or two in 100,000 athletes die in this way each year. No one knows why this increased risk exists, though some suggest extensive exercise can sometimes put strain on heart muscles, causing them to enlarge. But predicting which athletes will be affected is not easy. Dr Paulo Adami from the Institute of Sport Medicine and Science of the Italian Olympic Committee, studied athletes shortlisted for the Olympic games between 2004 and 2014. 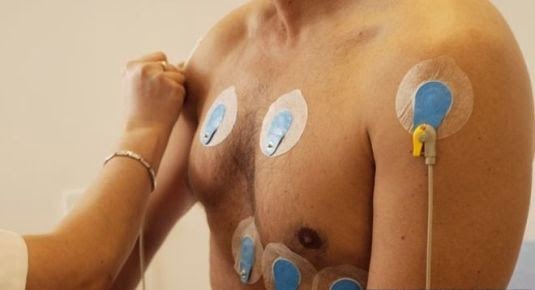 Tests included ECG tests (recordings the electrical activity of their hearts) both at rest and while doing exercise and ultrasound scans of their hearts. They picked up worrying signs in 300 athletes. After further investigations they found six with potentially life-threatening conditions which meant they could no longer compete. Some 165 were allowed to continue their careers with annual checks. But more than 100 individuals identified as at risk on the initial set of tests were dismissed as having spurious results or changes that were unlikely to lead to problems later. Dr Adami said: "We cannot take it for granted that elite athletes are healthy. "This study demonstrates that a more accurate assessment is necessary for elite professional athletes than for members of the general population, in view of the intensity and stress on their cardiovascular system. "We suggest that our model of screening is applied to all elite athletes, regardless of the sport they practise." 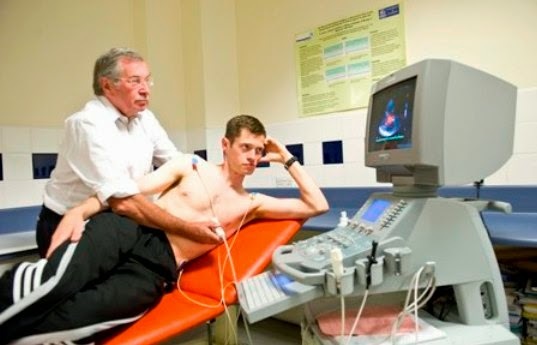 Dr Michael Knapton at the British Heart Foundation is hopeful that screening will one day be very useful for athletes. But for now he argues it is not reliable enough to be offered widely. He said: "We would have to screen an awful lot of people to save one life and in most of those people it might do more harm than good. "We could end up stopping ambitious young athletes from following their careers and worry them for no reason. "We might also falsely reassure people that they are fine when they are not." But he says the case is different for people known to be at high risk - for example families with genetic conditions that predispose them to sudden death. For these individuals the BHF supports tailored assessments by the NHS. Some organisations already offer screening to all young people and athletes. And the BHF says more people need to be aware of what to do if someone has a cardiac arrest in a public space. CPR, cardiopulmonary resuscitation involving chest compressions and mouth-to-mouth can help restart the heart in some cases. Meanwhile the UK national screening committee is reviewing the evolving evidence behind cardiac screening.